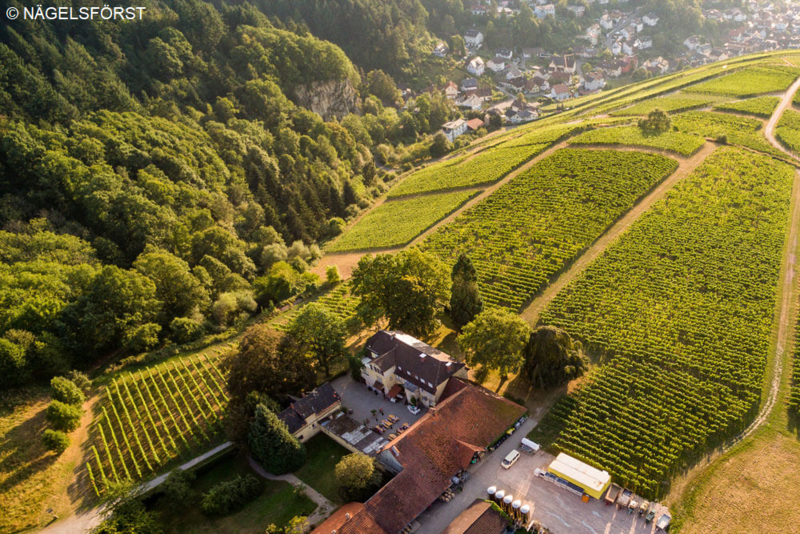 The traditional winery is located in Baden-Baden, district Varnhalt, in the German wine-growing region to bathe, Thanks to the surrounding mountains forms the climate the perfect basis for the cultivation of high-quality wines. This potential was recognized by the Cistercian the Lichtenthal Abbey already in 1268. They planted on the monastery rock for the first time Pinot Noir vines, they from the mother monastery of Cîteaux at Beaune ( Burgundy ). By the under Kaiser Napoleon (1769-1821) carried out secularization measures the possession in 1802 to the Margrave of Baden. The Margrave's court administration sold the estate in 1864 to Rudolf von Koch, who in 1870 co-founded Deutsche Bank in Berlin. Since the year 2016 the company is owned by a family from the Bavarian middle Franconia. A Straußwirtschaft is connected. The house also serves as an event location for wine tasting, weddings, family reunions, seminars, corporate events and cooking classes. Operations manager is Steffen Röll, the other responsibilities are carried out by Annette Bähr (cellar master), Waldemar Krapiec (sales), Patric Hohl (Kfm. Head and Marketing) and Tanja Frietsch (Events). The vineyards cover 33 hectares in the individual layers Stab the boys (Detour), Klosterbergfelsen (Varnhalt) Mauerberg (Neuweier), as well Engelsfelsen (Bühlertal). They are 70% with the white wine varieties Riesling. Sauvignon Blanc. Chardonnay. Gewurztraminer, Pinot Blanc ( Pinot Blanc ), Pinot Gris ( Pinot Gris ) and Auxerrois, as well as to 30% with the red wines Pinot Noir. Cabernet Sauvignon. Merlot and Tempranillo planted. The white wine vines are reduced to an average of 45 to 50 hl / ha, the red wine vines for the top wines even to 20 hl / ha in order to increase quality. The tripartite classification of wines (based on VDP classification model ) in estate wines, local wines and vineyard wines provides the modern key to origin stamped Wine culture on the one hand, and the easier assignment of the preferred wine for the consumer on the other. The white wines are mostly traditional big wooden barrel or in Barrique expanded to give them more longevity and structure in the taste. The red wines are made exclusively to traditional maceration at least 12 months in large oak barrels and dry aged in barrique. On the occasion of the 750th anniversary in 2018, the red wine cuvée "Quantum Reserve 750" was bottled in a clay bottle in a limited quantity. It was made from the varieties Cabernet Sauvignon, Merlot and Tempranillo true to the motto of the winery "Dreams drink. Experience time "assembled. In addition, also sweet wines are up Trockenbeerenauslese, bottled and bottled after 30 months of yeast storage Crémants, as well as alcohol-free sparkling wine produced. This page was last modified at 7 January 2019 at 11:14.